We made every effort to ensure that this review was accurate and fair, but we’re only human. If you think we’ve got something wrong, or that the review does not reflect your own experiences with the product, we’d love to hear from you. Leave a comment below, send us an service@ top5onlineinvoicing.com, or write your own review in the Customer Reviews section. FreshBooks is the first name that comes to mind when talking about online invoicing software. It has won many awards and is being used by over 5 million businesses of varying sizes for efficient invoicing, time tracking and payment processing. The lite package costs $15 per month if you want to subscribe to a monthly plan and $13.50 if you want to go for an annual plan. You get to create unlimited invoices for 5 clients, accept credit card payments and do invoice customization among other features. The plus package costs $25 per month if you choose a monthly plan and $22.50 if you choose an annual plan. You can bill up to 50 clients with it. Along with all the lite package features, you get features to send automated payment reminders, schedule recurring invoices and add late fees for invoices that are overdue. The premium package is priced at $50 per month if you want to pay every month and $45 if you want to subscribe to an annual payment plan. You can bill 500 clients with this package and all the plus package features are present as well. 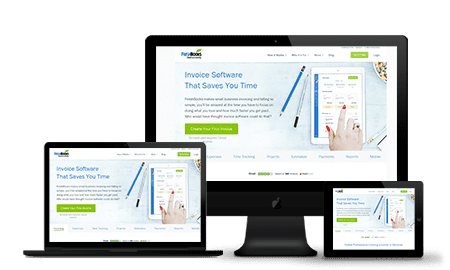 After taking the rich set of features that FreshBooks provides into consideration, it can be safely stated that FreshBooks’ pricing policy is indeed very reasonable. Even though many online invoicing software provide invoice customization features, none are as easy and rich as FreshBooks’. You can add your own logos, choose from different themes and set up personalized thank-you emails to give your invoice as professional a look as it can get. With a simple click on the sidebar, you are taken to the invoicing menu where you are shown real-time stats regarding how much payment is overdue, how much is outstanding and how much is in overdraft. All your invoices are also easily accessible from the “all invoices” section and creating a new invoice is as simple as making a few clicks. The marvels of technology have allowed us to automate so many aspects of our life, and with FreshBooks, you can even put your business on auto-pilot. You can send reminders at customizable intervals, charge late fees (based on percentages or a fixed fee), can automate sending invoices for recurring clients and can categorically secure credit card payments. FreshBooks also allows you to request clients to pay you deposits. This way you can receive a percentage of the total budget or a flat amount up-front and will not have to wait till the end of the project to receive a payment. FreshBooks has a “mark as billable” checkbox in the expenses section that lets you track all of the expenses you incurred for a client. This ensures that you bill for all the effort you put in and nothing remains off the books. You can attach specific clients to expenses and you will get reminded about the expense at the time of invoice creation, for the said client. Aforementioned were only some of the excellent features that FreshBooks provides. It also offers the ability to offer discounts, customize the payment terms for invoices, create invoices via mobile apps and automatically calculates taxes for you too. FreshBooks integrates with PayPal, VISA, MasterCard and American Express among many other payment gateways. It also integrates with many third-party applications including Zapier, Braintree, Capsule, Stripe, Basecamp, HubSpot and EazyBI etc. The FreshBooks platform makes it simple to find and add integrations to the software, and with many options available, users will be able to link their invoicing software with a number of other helpful business tools. Saying that FreshBooks is extremely easy to use will be an understatement. Its design is not only very simplified, it’s also very beautiful. Switching between sections is very simple and seamless. The dashboard is colorful, extremely intuitive and provides all the information that you would want to see when you start the application. Invoice creation, customization and searching is user-friendly as well. Even if you are a newbie, you shouldn’t face any real learning curve with FreshBooks. FreshBooks has a fairly responsive and professional customer team that can be reached via phone, email or a ticketing service. Information can also be obtained via a FAQ section, a blog present on the company website and the video tutorials present on the company’s YouTube channel. Phone support is available to their clients. The company’s agents can be reached via email. A few videos are available on the company’s YouTube channel. A fairly detailed FAQ section is present on the website. There is a regularly updated blog on various topics. FreshBooks is arguably the market leader when it comes to online invoicing software. It has a brilliant design and is very user-friendly and intuitive. Its invoice creation and customization is very efficient and it also comes with flexible expense management which makes sure that you get billed for all that you are worth and all the effort that you put in. Whether you want to secure your online payments or run your business on auto-pilot, there aren’t many better online invoicing software out there than FreshBooks. Gerald holds an honors degree in finance and with many years of experience helping small businesses gain capital for their start-ups makes for the perfect contributing writer to the Top 5 Online Invoicing blog. Our goal is to provide answers to all of your questions so you can make a confident purchasing decision. We welcome your feedback, so please email us at service@ top5onlineinvoicing.com with suggestions and questions. We’d love to hear from you!